After spending last summer in the studio working on her new five-song EP, award winning, indie singer-songwriter Lauren Marsh officially released Veracity on Friday January 22nd, 2016. A stirring collection of atmospheric indie-pop tunes, relying on synth and FX as they do ukulele and keyboard, Veracity is a testimony to leaving the past behind and choosing to live fully without holding back. Lauren recorded Veracity with producer Chris Badami, of Portrait Recording Studios in Pompton Plains, NJ, who's known for working with artists like: Madonna, Hayley Williams of Paramore, The Early November, Jennifer Rostock, and Janina Gavankar. Lauren’s track "Dear Love" was featured on NCIS New Orleans on CBS in Feburary and the track is currently #10 on Spotify "Broken Heart" playlist. Opening for Lauren is Giada J. - a multi-instrumental Italian-born (Cosenza), now Philly-based singer-songwriter who during a visit to the US in 2013 met local Philly singer-songwriter John Faye, and producer and Philly Sound Studios owner - Mariano Mattei. 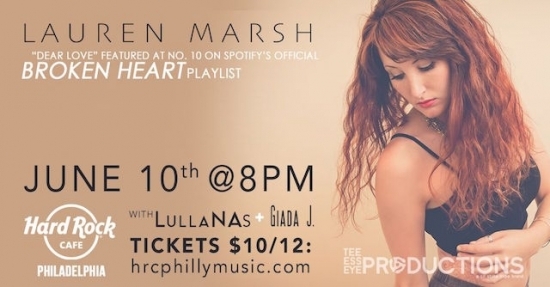 In May 2014, she decided to travel back to the US to record her first EP at Philly Sound Studios, with Mattei, and she released her first EP Songs To Deliver on on November 28, 2015. Kicking off the night is Philly-based singer/songwriter twin duo, LULLANAS. Some of their musical influences include the Civil Wars, the Lumineers, Kacey Musgraves, and Young the Giant. LULLANAS original tunes are stories -- stories that hold so much honesty, reliability, and meaning. They have been writing their stories into songs since 2012 and are emerging artists in the Philadelphia live music scene.